As we contemplate whether to throw Virginia in rice or an open fire, the newly-minted capital of Blackface has inspired a wave of racist yearbook photos that came back to haunt Democratic politicians and public figures. Virginia Governor Ralph “Coonman” Northam had to answer for a picture on his yearbook page of two men — one of whom was allegedly the Governor — wearing Blackface and full KKK garb respectively. The fact that it was Northam — a Democrat — that initiated the wave that has eclipsed the start of Black History Month is just proof that the legacy of racism imbued in the very fiber of America’s history isn’t partisan in its manifestation. Essentially, racist ignorance doesn’t follow party lines and its making a resurgence in the shared consciousness that no one asked for. Everybody wanna be a n*****, but nobody wanna live with the hard “ER”. A sentiment that has been proven once again — by the virtual flood of racist yearbook pictures that paint a goofy facade on a show of bigotry with a torrid racial past that manifests into real-world dangers for Black people. To make matters worse, the goofiness of it all is only exacerbated by the trainwreck masquerading as a press conference where Northam almost “bust a move” after admitting to a different instance of blackface — he applied shoe polish on his face to “look like” Michael Jackson in a dance competition that he ended up winning. Sigh. Governor Northam didn’t have to endure the harsh spotlight alone for long as he was joined by Virginia State Senate Majority Leader Tommy Norment and Attorney General Mark Herring. The State Senate Majority Leader was the editor of the Virginia Military Institute yearbook of 1968 — the same year VMI admitted Black students — which contained racial slurs and pictures of white men in Blackface reported Blavity. The Attorney General confirmed to dressing in Blackface in his youth when he dressed up as rapper Kurtis Blow. Blackface in the name of impersonating celebrities gets sanitized as a mere joke but when multiple white men dress up as slain teenager Trayvon Martin, it’s a stark reminder that reducing Black identity to a costume is a byproduct of the taught disrespect for the Black body and life. It’s funny for them and as we’ve come to discover more and more, it’s profitable. Our anger and pain are profitable because it translates into social media posts and movements that are further translated into clicks and web traffic that is void of context with a priority on numbers. What else could explain Black having to watch luxury brands like Prada and Gucci release derogatory designs in 2018 and 2019? Have we not suffered through this already? 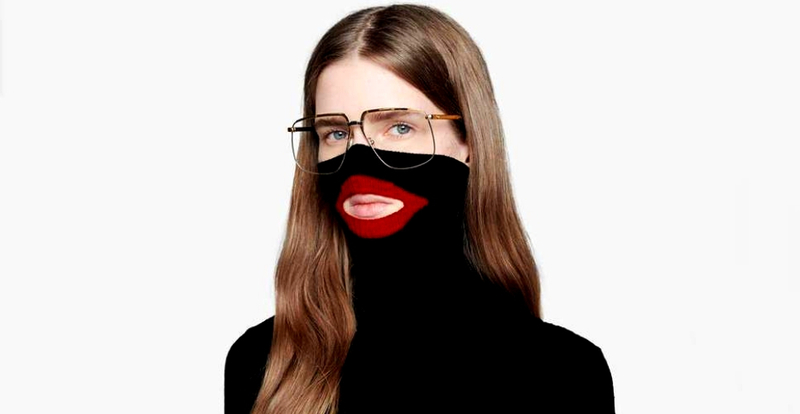 Even in the midst of all the Blackface flooding Black History Month, Gucci thought it would be wise to release an unconventional sweater that emulated the lips of a minstrel in a trend The Washington Post dubs as “Haute Couture Blackface.” This is the same Gucci that collaborated with Dapper Dan to atone for its appropriation sins, by the way. Is it callousness, carelessness or plain ignorance that allowed for a garment to designed, produced and sold before anyone realized the offensive nature of the piece? Was there no one to consider how it might make Dapper Dan feel to be tied to a brand that struggles to learn its lesson? Dan confirmed that the CEO of Gucci Marco Bazzari will fly from Italy to Harlem to speak to the iconic designer about the jersey in question. Sounds like good PR but I guess we’ll only find out if i’m being cynical when the next scandal drops. Prada dabbled in its own “Haute Couture Blackface” when it made the monstrous mistake of releasing Blackface figurines to accompany its bags and decorate its New York store windows. This is the same Prada released a t-shirt with Angela Davis — an outspoken anto-Capitalist activist — on it for their Spring 2018, comic-book inspired collection. The shirt cost $500. White capital has managed to find a way to profit off of Black rage as well as the Black body so I gather we’ll be living through half-assed apologies for a while. Dapper Dan said it best: “I am a Black man before I am a brand.” We are human before we are any of these unimaginative caricatures that racists reduce us to — knowingly and otherwise. No Black person deserves to be governed by someone so removed from the Black experience that they would only understand why Blackface is bad in 2019. Black people deserve brands that see us instead of poaching our vision one day and disrespecting us the next. Our art matters. Our culture matters. Our lives matter. There is no one to convince of this fact, although everyone needs to be reintroduced to it, yesterday.